Spend an afternoon with this incredible Swainson's hawk and learn some basic drawing techniques as we draw this bird in real time. This is a great class for beginners or anyone looking to take their drawing practice to the next level. We will be exploring bird anatomy and will practice quick gesture drawing techniques as well as longer studies. This is the perfect class to set you on your way to capturing nature’s beauty as it unfolds. We will be working with different types of charcoal and pastels on large paper. All supplies will be provided. 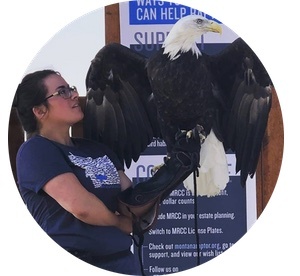 Teresa Aldrich from the Montana Raptor Conservation Center will be here to educate us about raptors and the incredible work done at the center—improving the welfare of raptors across Montana through rehabilitation of injured birds, community education, and partnerships for raptor conservation and research. Megan Thornton, artist and childhood educator will be assisting in the drawing process. You will be working with charcoal and pastel and will learn the basic bird anatomy as well as beginning drawing techniques to help you capture this beautiful moment. Teresa Aldrich—began working at Reptile Gardens in Rapid City, SD in 2010, where she formed her passion for raptors. In 2011 she moved to St. Louis and completed an internship at the World Bird Sanctuary, doing public bird shows and raptor rehabilitation. Teresa then returned to Reptile Gardens in 2013 and became Assistant Curator of the Bird Department. In 2017, Teresa continued to follow her passion and moved to Bozeman as MRCC’s Education Specialist. When Teresa is not working with birds she enjoys hiking with her dog on the beautiful Montana trails and singing jazz music at local cafes. Megan Thornton—lives in Bozeman with her husband and two young children. She's passionate about early childhood development and runs an in home preschool that emphasizes play and nature. She's had a love for drawing since childhood and has worked to improve her skills over the years. Megan has been active in various figure drawing groups and has taught adults to draw through continuing education. She considers drawing a form of meditation and a skill that anyone can develop with guidance and perseverance.